Purpose: To report a case of a 73-year-old man who presented with decreased visual acuity due to bilateral macular edema after paclitaxel administration for prostate cancer. Methods: The ophthalmic evaluation consisted of medical and ocular history, Best Corrected Visual Acuity, slit-lamp biomicroscopy and Spectral-domain optical coherence tomography / Fluorescein Angiography. 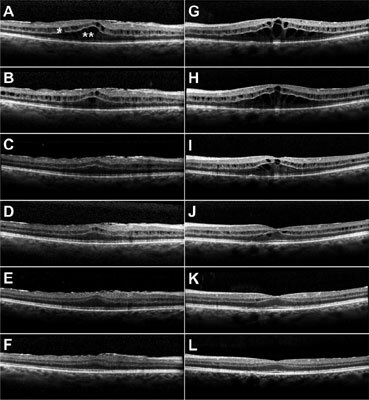 Results: Optical Coherence Tomography and Fluorescein Angiography revealed silent cystoid macular edema. After consulting with the oncologist, the cessation of paclitaxel therapy was decided. The patient presented a gradual but steady resumption of the retinal edema, with complete restoration of normal retinal morphology and function within two months. The pathogenesis of the silent Cystoid Macular Edema (CME) is still unclear. Based on our case and a critical review of the previous observations and published data, we propose that the underlying cause of Taxane induced CME is the functional failure of Aquaporin mediated water transport at the level of retinal Intermediate and Deep capillary plexuses, and at lesser extent at the level of the Retinal Pigment Epithelium. Conclusion: Taxane induced silent CME should be attributed to the action of Taxanes on the microtubule guided aquaporin vesicles transport to the cell membrane. In our case of Taxane induced silent CME, withdrawal of the taxane was enough for complete recovery, and no additional treatment was needed. Cystoid macular edema, taxanes, paclitaxel, aquaporins, angiographically silent macular edema, integrated pathogenic theory.